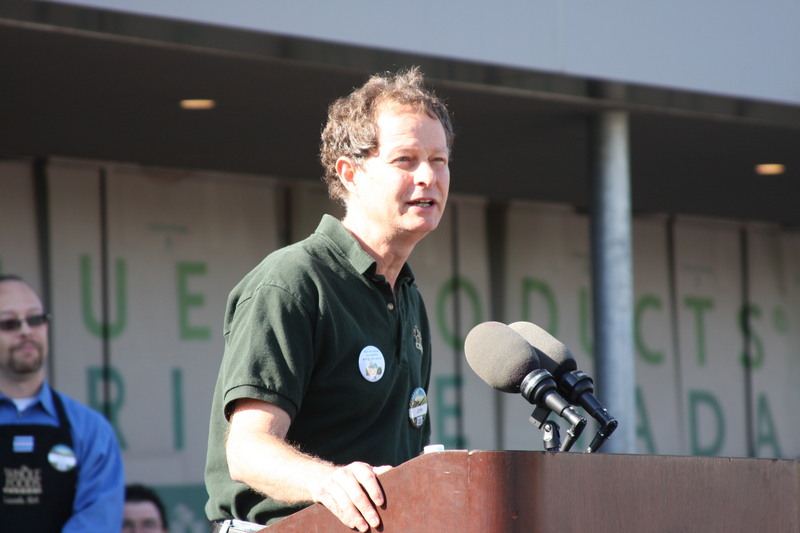 The founder and CEO of Whole Foods, John Mackey, joins us on Chicago Tonight at 7:00 pm to talk about the popular supermarket chain, as well as his outspoken political views and ideas about corporate reform. Watch a web-exclusive conversation with Mackey below, and read an excerpt from his book. A higher purpose gives great energy and relevance to a company and its brand. Google’s original purpose was to organize the world’s information and make it easily accessible and useful. As founders Larry Page and Sergey Brin said, “How can that not get you excited?”5 REI’s purpose is to reconnect people with nature. The Container Store helps people get organized so they can be happier. Consider Southwest Airlines, perhaps the most successful airline in the history of the world. Southwest’s animating purpose from day one was to democratize the skies, that is, to make air travel accessible to the average person. When Southwest came into being in the early 1970s, only 15 percent of Americans had flown on an airplane; today, more than 85 percent have flown, due largely to Southwest’s pioneering efforts to offer low fares, bring air service to smaller markets, and market it in a fun way. Southwest has been consistently profitable since it started operations. It provides a great experience for customers. Team members love working there. The company is founded on having fun and radiating love (its stock symbol is LUV). Whole Foods Market is passionate about helping people to eat well, improve the quality of their lives, and increase their lifespan. Our purpose is to teach people that what they put into their bodies makes a difference, not only to their health and to that of the people who supply the food, but also to the health of the planet as a whole. From our start in 1978 as Safer Way, Whole Foods Market has promoted organic food and the agricultural systems from which it derives. By helping to develop markets, customers, distribution networks, and even the national standards for labeling for organic foods, Whole Foods has also promoted the environmental benefits that accompany the increasing number of organic farms, dairies, ranches, and sustainable agricultural practices. For example, because organic farms utilize no synthetic fertilizers or pesticides, there is reduced usage of fossil fuels and less chemical contamination entering food chains and water supplies. Purpose is something we can never take for granted; the moment we do, it starts to be forgotten and soon disappears. It has to be at the forefront of consciousness (and therefore decision making) literally all the time. When the purpose is clear, leadership teams can make quicker and better decisions. Clarity of purpose also leads to bolder decisions. Rather than adjusting decisions according to the winds of public opinion or changes in the competitive environment, decisions in a purpose-driven company take those things into consideration while also being informed by something more soulful and sturdy. This leads to superior overall performance. Purpose-informed decision making is a critical connection point between clarity of purpose and superior performance, financially and otherwise. Reprinted by permission of Harvard Business Review Press. Excerpted from Conscious Capitalism: Liberating the Heroic Spirit of Business. Copyright 2013 Harvard Business School Publishing Corporation. All rights reserved.